Long ago before humans had left the area of Babylon, there lived a forest. In this forest lived animals, vibrant and huge. Everything was balanced in the forest, everything in its rightful place until one day a single human found this forest. The gentle creatures took to the gorgeous woman, playing with her golden knee length hair. Her green eyes gentle as she sang with the birds, ran with the deer, and swam with the fish. One night the woman was walking through the forest instead of sleeping in her cave as her per her usual habit. No, she wanted to find the howling that lulled her to sleep. She wanted to find the carnivores creatures that terrified her gentle friends. 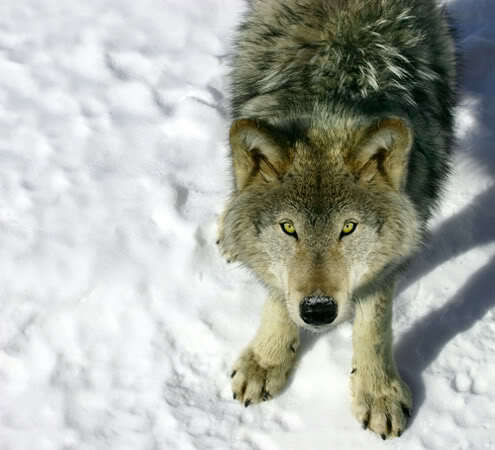 As she crept farther into the forest, away from familiar territory, her heart speeding up when a howl sounded closer than she was comfortable with. Swallowing back her fear she pressed on, yelping when something fell on her. A quick brush showed it was just a leaf. Sighing, the woman continued on, stopping only when she reached a clearing. Her breath hitched as her gaze came to rest on one of the most beautiful creatures she had ever seen. 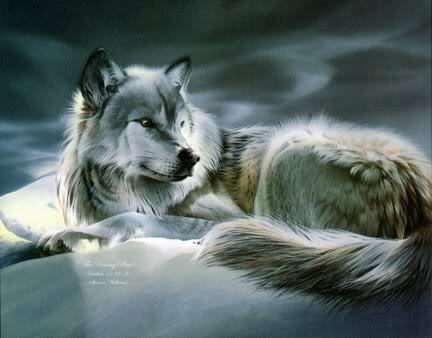 His silver pelt shining as the moonlight lit it. His golden eyes were locked on her throat as he stalked towards her, his pace gradually increasing until he was running at her. Propelled by instinct the woman took off back into the forest. Howls filled the night air, sending chills down her sweat covered body. Tears were quickly forming, blurring her vision. She didn’t dare look behind her for she had to focus on staying upright. As her dress caught on a branch, tearing it until it barely covered her thighs, the woman fell to the ground seeing white as the breath left her. The woman opened her eyes as the air came back only to have it leave in a scream as golden eyes stared back at her. The creature crouched over her his teeth bare. Tilting her head away from the snarling creature, a desperate plea making her lips move. Rune came back to the present with a jolt. His side was warm were his mother and younger siblings slept. Yawning against the cold winter air, Rune stood his body going rigid as he stretched his still sleeping muscles. He felt his family shift at the loss of warmth. A quick shake had the light snow that had fallen last off his pelt. Rune bound over towards his friend, nudging the other’s head roughly. “Wake up, wake up, wake up, come on we have to go for our run. You promised no more slacking off about this.” Rune whined quietly as he licked snow off the other. His silver eyes dancing with mischief as he nudged his friend rougher this time. Chance slept soundly in his circle with his family. His brothers slept behind him, while his parents slept at the back of the formation. Chance liked to be on the outside, plus he knew his best friend had a very bad habit of waking him up. Chance, covered in snow, felt no cold. His thick fur saved him from the frozen life around him. And then the silence around him was broken. ‘Rune…’ he thought as he opened his heavy eyelids, revealing his golden eyes. As he lifted his head to see Rune, he smiled. “Yeah I know what I said, but I didn’t think you would actually want to do it…” he joked as he stood up slowly, shaking the snow off his back and tail. He stretched his back and legs, releasing a whine as he did so. He looked at his friend and then nudged his chin with his muzzle before he started dashing off into the woods. “Are you coming?” he called from behind him, laughing as he ran into the white. Chance loved to run. That was actually the reason that he had received his name. When he was just learning to walk, he started trying to run. One day he was in the woods with his family, learning various survival tactics, when he started wondering off. Having six brothers made it very hard for his mother and father to keep track of them all, since this was their first litter. Chance wandered into a den. The warmth drew him in farther and farther. Soon he found himself resting against something large and furry. It had a very strange smell he had never smelled in his whole life. Soon a large growl echoed through the cave. The little pup slowly backed away from the comfy creature before him. The creature turned to face the baby. Chance’s ears pinned to his head as he backed away slowly, but his tail got in the way. He stepped on it and tripped, falling to the ground. He yelped in the process, the echo rang through the den, making the creature angry. It started growling louder and now baring it’s teeth. Finally chance was out of the cave, but not away from danger. He let out a small howl, trying to call for help. The creature exited the den and went straight for the wolf pup. It was a brown bear. Right as the bear was lifting it’s massive paw to strike the youngling, Chance’s father jumped onto the back of the beast, biting hard into its pelt. He sank his teeth in deeply, making blood trickle down the back, staining the fun. Soon more wolves came to the rescue, helping Chance’s father and saving the pup. That night his mother gave him the name, saying he got a second chance at life.